PETERSBURG ON THE NIGHT OF 17 JUNE, 1864. After his defeat at Cold Harbor General Grant determined to capture Petersburg by rapidly transferring his army to the South of the James before General Lee could detect his intentions. On 13 June, 1864, he detached General W. F. Smith with the Eighteenth Corps, who reached Bermuda Hundreds on the 14th, and by next morning began his attack on Petersburg. To oppose these troops, only Wise’s Brigade and some transient forces, the whole amounting to not more than 2,400 effective men, were available. These embraced a small cavalry force under General Dearing and Archer’s militia; but these militia proved themselves rivals in valor of the veterans by whose side they fought. All day [on June 15, 1864] this handful of men resisted the attack of 16,000 of Grant’s troops, but late in the evening they were driven from their position, and the enemy carried the line of redoubts from Nos. 5 to 9. Had this success of General Smith’s corps been vigorously pushed Petersburg must have fallen. At 9:30 a. m. on 15 June, Beauregard telegraphed Bragg to send him Ransom’s [North Carolina] Brigade. The brigade was then at Chaffin’s Bluff. It was ordered to report to General Beauregard at once, and marching all night reached Petersburg about sunrise on the 16th [of June 1864]. Arriving in sight of the inner line of the works defending Petersburg the enemy were seen advancing upon the same. At a run, through a storm of shot and shell, the Confederates succeeded in getting to the works just in time to meet the enemy’s charge and drive them back. The Thirty-fifth [North Carolina] regiment were among the first of the brigade to arrive, and repulsed two assaults of the enemy. Hancock now reinforces Smith, and Beauregard orders Johnson’s division from the lines of Bermuda Hundreds. Burnside’s corps is now added to the Federal attacking columns. Hancock, now in command, his forces augmented to 53,000, in the afternoon of the 16th attacked all along the line held by 10,000 Confederates. Night closed the unequal contest with the lines still firmly held by Beauregard. During the night Warren’s [Fifth] Corps, 17,000, reinforced the enemy. Early on 17 June  the fighting was renewed. Assault after assault was made only to be repulsed until just at dark a part of the Confederate line was pierced and Battery 14 was captured by Leslie’s Division of the Ninth army corps. About 11 p. m., Ransom’s Brigade was ordered to the support of Wise, who had been driven from the salient occupied by his brigade. Ransom’s Brigade was ordered to charge and re-establish the line. The Thirty-fifth [North Carolina] Regiment struck the heel of the salient, formed in the shape of a horse shoe and received the enemy’s fire both from the front and flanks. Reaching the works a hand to hand combat took place, the men fighting with only the parapet of the rifle pits separating them. Here the colors of the Thirty-fifth Regiment were captured by Corporal Young, of the First Michigan, but the Thirty-fifth captured three flags from the enemy. The loss of the regiment was very heavy. It carried into action 28 officers and nearly 500 men, and brought out 8 officers and less than 200 men. Its gallant commander, [Colonel] John G. Jones, was shot down early in the charge; rising he advanced a few feet, when he fell a second time. Calling for help, he was again going forward; when shot a third time he fell to rise no more. The gallant and chivalrous Captain Thomas J. Blackwell, of Company B, was here killed, many others killed and wounded and a number captured. Captain Philip J. Johnson, of Company K, mounted the breastworks, and in a hand to hand encounter with a Federal Major, was shot in the hand, causing his sword to fall from his grasp; he was now at the mercy of his antagonist, when one of Captain Johnston’s men shot the Federal officer through the head. Ordering some imaginary reinforcements to advance, in stentorian tones, Captain Johnston called upon the enemy to surrender, or all be killed, and some 300 came over the works and gave themselves up. During the night [of June 17-18, 1864], General Beauregard withdrew to a new and shorter line of defenses nearer the city. In the death of Colonel Jones the regiment sustained a loss almost irreparable. He had been a student at Wake Forest College; was a Baptist preacher before he entered the army; was without any military training, awkward and unsoldierly in his carriage; but of unsullied character and indomitable courage. His military aptness was of slow growth, but developed as he gained experience until at his death he was recognized as one of the best soldiers of his rank in the army. Prior to the battle of Sharpsburg, his courage was questioned; as, unfortunately for his reputation, he was excused on account of sickness and was not present at the battles in which his regiment had been engaged prior to the Maryland campaign of 1862. At Sharpsburg his conduct was altogether creditable; and thenceforth he won the confidence of his superiors and of his men. It was currently believed in the regiment, that while stationed at Kenansville, N. C. in the winter of 1863 and 1864, he met a young lady of very high social position and great personal charms; he became much interested in her, but did not presume to declare his passion until he had won her by “the dangers he had passed,” and that he only waited until he could wear the wreath of a Brigadier-General on his collar, when he would solicit her hand. Lieutenant-Colonel J[ames]. T. Johnston and Major S[imon]. B. Taylor now [presumably in mid-June soon after Jones’ death, maybe even June 18] became respectively Colonel and Lieutenant-Colonel and Captain Robert E. Petty, of Company D, Major of the regiment. First Lieutenant G. W. Freeman was promoted to be Captain of Company B. On 18 June, 1864, General Meade made the last of his series of assaults to carry the fortifications defending Petersburg. He had now the larger part of his army confronting the Confederate lines, something like 70,000 men. These latter had been reinforced, and there were now about 20,000 Confederate troops to resist the attacks of these seventy thousand. The assault was made by the commands of Warren, Bumside, Birney and Martindale. “At noon came the grand attack, which was promptly repulsed. At 4 p. m. the Federals tried it again, but met with signal defeat.” General Grant now issued an order for the cessation of further attacks, and the siege of Petersburg commenced. Ransom’s brigade constructed the breastworks at the Crater and were in the trenches on the left of the salient occupied by Pegram’s Battery and Elliott’s South Carolina Brigade at the time of the explosion of the mine (30 July, 1864). 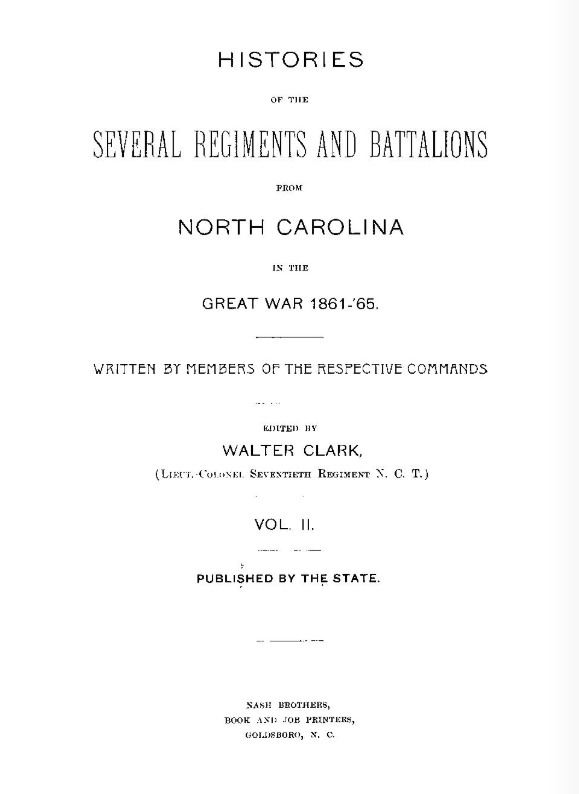 The Twenty-fifth [North Carolina] and Forty-ninth [North Carolina] Regiments of the Brigade were drawn out of the works to assist in repelling the advance of the enemy now pouring through this interval in the Confederate defenses; and subsequently they united with Mahone’s Division in driving the Federals out of the captured works back to their lines. During this time the Thirty-fifth Regiment extending its front to occupy the space vacated by the withdrawn troops, repelled the several assaults of the enemy as they attempted to carry our works adjacent to those destroyed by the explosion. It will be interesting here to state that the colors of the First Michigan were captured at this battle by Sergeant J. W. Connell, of Company F, Twenty-second South Carolina Regiment. It will be remembered that the flag of the Thirty-fifth regiment had been captured by this Michigan command the night of 17 June, as previously stated. The last act in the drama was now to be played. The Army of Northern Virginia, between 5 May and 31 December, 1864, had inflicted a loss of more than 108,000 killed, wounded and missing, on the army of the Potomac, sustaining itself a loss of 40,000; but how it would end was now apparently only a question of time. In the siege of Petersburg, the Thirty-fifth Regiment performed its full duty. For eight months and more “it lived in the ground, walked in wet ditches, ate its cold rations in ditches, slept in dirt-covered pits.” The breastworks of the two armies were in many places so near that one exposing any part of his person was sure to be shot at and usually killed or wounded. The picket posts could only be relieved at night by crawling along ditches to and from them. Mortar shells were incessantly coming down from above. There was no shelter from sun or rain. ‘No food could be cooked there, but the scanty ration was brought in bags on the shoulders from the cook yards sometimes a mile distant. Frequently it became necessary for General Lee to withdraw troops from some portion of his line to resist a movement of the enemy against the Petersburg & Weldon and Southside railroads. In the latter part of August [18-21], 1864, Ransom’s brigade was ordered to attack and drive back the enemy at the Davis house. They had to charge some distance through an abatis of felled trees. The men had to pick their way through the interlaced timbers and advance without regard to company or regimental formations. FORT STEADMAN [sic, STEDMAN]—HARE’S HILL. In the assault on Fort Steadman [sic, Stedman], 25 March, 1865, General Matt. W. Ransom commanded his own and Wallace’s South Carolina brigade. In his report of this brilliant, but disastrous attack, General Lee says: “The two brigades commanded by General Ransom behaved most handsomely.” The Thirty-fifth regiment lost largely in killed, wounded and prisoners. Here, Courier Wm. Hood, of Company H, referred to in the account of the battle of Sharpsburg, was killed. He was one of the best couriers, prompt to carry orders, under all circumstances trustworthy and fearless. “In this assault, Colonel [James T.] Johnston, Captain S[anford]. G. Howie, Company F, and many others of the Thirty-fifth [North Carolina] Regiment, and about half of Ransom’s brigade, were taken prisoners. At Five Forks (1 April, 1865) that dark day for the Confederacy, the Thirty-fifth [North Carolina] regiment, from the beginning of the fight for four hours, until it ended in what may be called a wreck, behaved with its accustomed courage and fortitude. Here Lieutenant-Colonel [Simon B.] Taylor was wounded and captured and about half of the regiment made prisoners. Colonel Taylor , who was in command of his regiment and had been twice previously wounded, received his third wound—a minie ball fracturing the bones of his right arm, forever disabling him from its full use. Captain Sterling Gee, Assistant Adjutant-General of the brigade, was killed, and Adjutant [Robert B.] Peebles, of the Thirty-fifth Regiment, was promoted on the field to succeed him. General Ransom had two horses killed under him. The last horse, a magnificent thoroughbred stallion, when shot, reared high up in the air and fell, pinioning- his rider beneath him. With his wounded left arm in a sling. General Ransom was powerless and in danger of being crushed under the struggles of his dying horse, when Captain [Philip J.] Johnston, of the Thirty-fifth [North Carolina], and Captain [James H.] Sherrill, of the Forty-ninth [North Carolina] Regiments, rushed forward and extricated him from his perilous situation and from capture. At last the end came, and on 9 April, 1865, General Lee surrenders the Army of Northern Virginia ; that “incomparable infantry, that array of tattered uniforms, but bright muskets;” which will ever live in history and in the hearts of the Southern people. The list of paroled prisoners of Lee’s army at Appomattox aggregated 28,231, of which Ransom’s Brigade numbered 41 officers and 394 enlisted men; of these the Thirty-fifth regiment, commanded by Major Robert E. Petty, numbered about 80. Did not space forbid, it would be a pleasing duty to mention by name and circumstance the many instances of individual heroism and meritorious conduct of the officers and men of this famous regiment in its three and a half years of service in the Confederate army. Though its discipline was excellent, its drill admirable and its efficiency always remarkable, of its several commanders not one was a martinet or a trained soldier. He, who was its commander from April, 1862, to April, 1865, first as its Colonel, and then as General, was never known to court-martial or put an officer under arrest; never had a private punished or put on extra duty ; never asked for a court-martial in any case ; never preferred a charge against an officer or private. You may ask how was discipline secured and obedience enforced. The answer is moral force. The rank and file were of the best material from which to obtain a volunteer army. They were patriotic, moral, tractable, willing always to undertake any service, to undergo any hardship; and though the regiment never had a Chaplain, the command was conspicuous for the religious tone that prevailed. The subsequent conduct of those composing the regiment after they ceased to be soldiers and again resumed civil occupations, has been in harmony with their honorable record as soldiers. In addition to the references to certain officers and men that have been made in the progress of this sketch, we may state that at this present writing (9 April, 1901) Colonel James T. Johnston is a successful and beloved physician at Hickory, N. C. Lieutenant-Colonel S. B. Taylor is a prosperous merchant and influential citizen of Onslow. Major Robert E. Petty, a merchant, at one time in Raleigh and later at Sanford, has recently died. Captain Henry W. Humphrey and Lieutenant Brinson Venters, of Company A, prosperous and respected citizens of Onslow county. Captain G. W. Freeman, of Company B, a physician of large practice at Marion. Captain E. McN. Blue, of Company C, for many years sheriff of Moore County, respected and esteemed by all. Captain J. W. Philpot, of Company E, a prosperous farmer of Person county ; Captain S. G. Howie, of Company F, a successful merchant at Monroe. Captain H. M. Dixon, of Company H, who had the honor twice to command his company, is a man of great popularity in his county of Mecklenburg, recognized as one of its best farmers and a man of great influence in his church. Captain D. G. Maxwell, of the same company, has for thirty-five years or more been a magistrate in Charlotte. In that flourishing city his decisions are regarded among his large clientele as the law and gospel, and if a minister does not perform the marriage ceremony, the people do not think themselves properly joined together unless “Squire Dave Maxwell” ties the knot. Orderly Sergeant James M. Davis, of the same company is a leading man in his county, one of its most prosperous farmers and successful business men. Captain Philip J. Johnston, of Company K, a merchant at Lenoir, Caldwell county, a citizen of largest influence and most highly esteemed. First Lieutenant Pinkney Warlick, of the same company, often a member of the State Legislature, a successful man of affairs near Connelly Springs. Among the officers and men in this regiment are many heroes whose name and their deeds are recorded in the Book of Life. Here—as gems of purest ray are concealed in the ocean’s cave—they may not be known, but a celestial glory is theirs and at the last great day they will receive their reward.